Thai people love emblems, especially in celebratory of very special occasions. For Thailand’s beloved King Bhumibol Adulyadej, there has been no shortage of Royal Celebratory Emblems, and the lengthy process in finding the right designs for them. There has been 2 official emblems when marking the special birthday anniversaries of the king, namely the 5th, 6th and 7th Cycle celebrations, as well as for the Diamond Jubilee of 2006. One would be from the government, to be used officially around the land, and one from the Royal Household Bureau, in the form of pins, to be dispatched by His Majesty the King, and members of the Royal Family to descendants of the different Royal Houses as well as to those close to and in service to the Royal Family. The Silver Jubilee was celebrated during the premiership of Field Marshal Thanom Kittikachorn. It was a time of military dictatorship and political uncertainty in Thailand, but the King was regarded as above politics, and was much loved. The King and the Royal Family was busy visiting the Thai people in all parts of the Kingdom, bringing much needed help to the people. 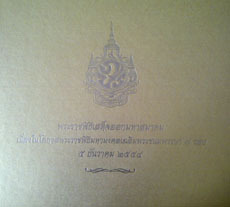 A new grand road was built in His Majesty's honour and named Rajdapisek Road, meaning Silver Jubilee in Thai. Official emblem at left, and the Royal Emblem Pin at right. 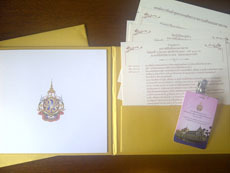 Members of all the Royal Houses of Thailand were invited for an audience with the King at the Sala Dusidalai, Chitralada Villa, Dusit Palace. It was the largest gathering of descendants of the Chakri Dynasty. Members stood in their allotted family space, with the head of each Royal House standing at the front of the line, and the King and the Royal Family greeted as many as they could in a few hours. His Majesty King Bhumibol Adulyadej had surpassed King Chulalongkorn as the longest reigning Thai Monarch, who ruled Siam for 42 years. This was thus another special time which caused for a big celebration. 2 July 1988 marked 42 years and 23 days on the Throne, a day passed King Chulalongkorn's reign. 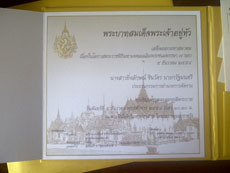 It was the first time a Golden Jubilee was celebrated in Thailand, so it became a big and important event. The outer ring road was built in His Majesty's honour, linking Nonthaburi, Patumthani, Samutprakarn and Ayutthaya. It was named Kanchanapisek Road, meaning Golden Jubilee in Thai, expanding Bangkok and its development to the next towns. This one has a very special personal memory, as the Royal Emblem Pin was given to me by HRH Princess Galyani Vadhana, at a lunchoen table in Vina del Mar, Chile, before she boarded a cruise ship that same afternoon to tour the Southernmost part of the world. The Diamond Jubilee was a very special occasion, as the Thai people also celebrated His Majesty being the longest reighning monarch in the world as well. It was also the largest gathering of Royals from around the world in Thailand, and anywhere in the world, as there has never been an event where all the ruling monarchs came together. It was also a time when the Thai people on the whole were completely united. It was a special event, as normally most of the people of the world see 80 as a milestone age, so Thai people continued the celebrations from the Diamond Jubilee of the year before. Many Thai jewellers commissioned special watches to celebrate this event, including Audemars Piguet which produced a limited version of 50 especially for the Thai market. Oris, another welknown watch company, also produced a limited version of 1,927, after His Majesty's birth year. 84 years is an extremely auspicious age, completing 7 cycles of life on earth. With Thailand in restless political squabble for the past 3-4 years, and people depending more and more on the ailing King as the only strong pillar of the Kingdom, we are witnessing outpouring of love from around the land. Thai people have also just witnessed the worst flood crisis ever lasting more than 3 months in some areas. It was a crisis not from natural causes, but from an error of judgement, as well as from individuals wanting to achieve vote gains during a local election, contributed to the disaster. The King's heart broken, and the people suffered, because of the political squabbling. But, Thai people do what they do best - celebrate their love for the King. Another happy moment in the Thai Kingdom. Official emblem at left, and commemorative bank note at right. The Platinum Jubilee or 70th year anniversary on the throne of KIng Bhumibol Adulyadej happended during the king's illness. There were no big celebrations, apart from the traditional Buddhist ceremonies attended by Crown Prince Maha Vajiralongkorn and members of the Royal Family. To mark the event, the Thai government introduced to the public a special 70 Baht bank notes, which sold in no time, as expected. With the recent political turmoil, and with the military having taken over the running of the country, the Thai people still hold dear their respect for the king, who is the longest reigning monarch in the world.